We have been spending the last few weeks at the shop fighting off the winter doldrums with spring tulips, blooming branches and beautiful plants! Some local brews helped with that too at our terrarium workshop last week. Our friends at Strangeways Brewing were kind enough to open up their space for us to host a terrarium workshop! 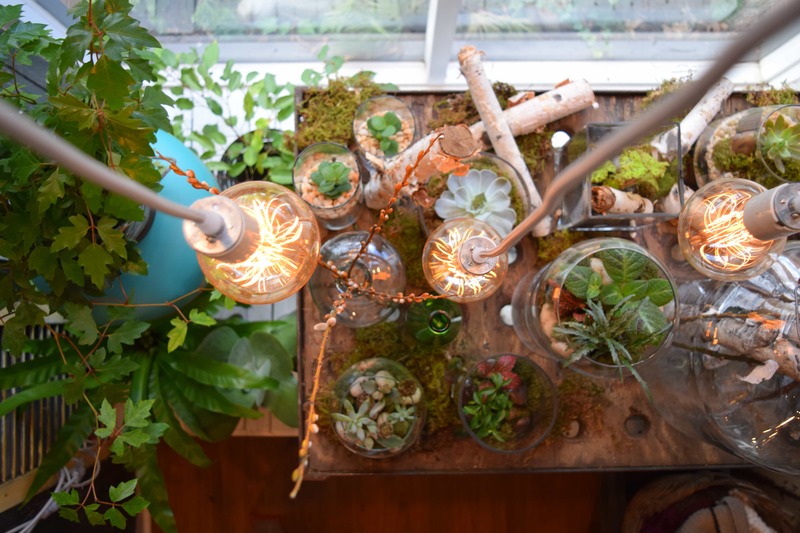 We wanted to share some special moments from the evening and tell you about our other workshops that will help you beat the winter blues and add some green to your space! Let’s get down to the most important part, beer. Strangeways Brewing is really one of the best breweries and tap rooms in Richmond. Their 8.400 square foot production brewery is open daily and features over 25 unique beers on tap. Their space is eclectic, industrial and extremely welcoming. They craft their beers with two things in mind, Think Strange and Drink Strange. This is accomplished using the finest ingredients and carefully aging their beers to perfection. We’ll wait here while you run out to grab a growler of their Albino Monkey Belgian White Ale before you read on. Now that you have a delicious beer, you’re halfway to beating the winter blues! The best way to enjoy a craft beer is with friends and plants! Our workshop at Strangeways was taught by our plant fanatic, Brenna, and focused on creating an open terrarium centered on succulents. Brenna started with a layering technique of gravel, activated carbon and fresh, clean soil. Next she explained different ways to artfully arrange a collection of succulents showing how the different textures and colors play off of each other. After the succulents were in place it was time to fill in with additional soil. Using a mixture of gravel, large river rocks and fresh green sheet moss, Brenna instructed everyone on how to creatively cover the soil and secure the plants. Lastly, we all decorated our creations with over sized dinosaurs, geodes, scary bugs and adorable garden benches! Who doesn’t love a little Jurassic Park world? Didn’t get a chance to attend this workshop? Don’t fret! Here is a list of our upcoming workshops! Reserve your spot on our website! We also do private workshops with a minimum of three people and your choice of topic! Contact us for more information!